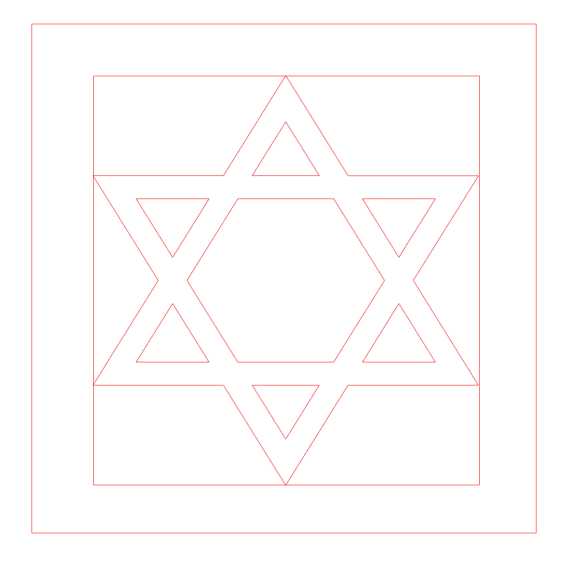 Can someone please help me figure out how to make a square card with a frame and cut into the frame is a large star of david. When I did it, the entire star cut out, but I would like the triangles and the center to stay put. Does this make sense? Please help a co worker lost their mother and I want a simple card, Thanks! You can either use the reverse eraser to connect the star to the square, weld little rectangles to the tips and the square or the node editing tool. You can also make the star slightly larger and weld to the rectangle. This was done with welding rectangles. It is all dependent on how you want the brdges to look holding the shapes. That was done by making the star bigger and then welding - I like it better. There are multiple ways to get any design and it is all personal taste. Thank you so much. This is perfect! I really appreciate the assist!